Consultations with our doctors are always provided at no charge. New patients are usually able to be seen the same day! If you require medical care in conjunction with our services, we will refer you to a specialist experienced in treating auto related injuries. If you need legal advice we can recommend a list of experienced attornies who will provide a free initial consultation. Anderson Chiropractic Center accepts auto insurance or attorney representation. We are happy to file all of your insurance claims for you. Auto accident injuries are usually 100% covered by insurance. This is an x-ray of one of our patients 6 years after an auto accident. She was prescribed medication and massage, but never addressed the structural cause of her problems. 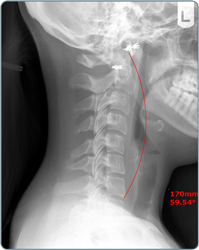 The proper forward curve in her neck is supposed to be right along the red line in the x-ray. After 6 years of suffering, she is finally pain free after receiving care at Anderson Chiropractic Center! Make sure you immediately attend to your injuries. Schedule an exam with a chiropractor within 24 hours of a fall, accident, or injury. Even if you feel your injuries are minor, a consultation with our doctor is always done at no charge. Consult with an attorney. Make sure you understand your rights. Most attorneys will provide an initial consultation at no charge. If you are unsure of which attorney to use, we would be happy to recommend one with extensive experience in personal injury law. Call a skilled chiropractor who understands the unique injuries caused by auto accidents. Anderson Chiropractic Center proudly serves Holly Springs and surrounding communities for all of their personal injury needs. Since we never charge for a consultation with our doctor, there is no reason not to schedule an appointment after every accident or injury. Do not miss your scheduled medical/chiropractic appointments. Doing so may create the false impression that your injuries were not serious; that you weren’t making your best effort to get well; or that you made your injuries worse by failing to adhere to the recommended treatment. Do not sign any documents without consulting with an attorney. Many insurance companies will quickly try to get you to sign a release from further liability by offering a small amount of money (usually a few hundred dollars). Once a release is signed, you can’t go back and ask for more, even if you’re still hurt, or get worse (which may happen if your injuries are left untreated). Mistake #1: Failing To Seek Immediate Treatment From A Specialist After An Accident. Each year, 10% of the population will be involved in an automobile accident. 20% of all accidents lead to SERIOUS and long-term injuries, yet 30% of those involved never seek treatment. Pain is your body’s alarm bell telling you something is wrong. Masking pain with medication is like taking the batteries out of the smoke detector. You are turning off the alarm instead of putting out the fire. Drugs only mask your pain for a few hours. When they wear off, your symptoms return. In our clinic, we put 100% of our focus on reducing your pain by focusing on the cause of your pain. This approach has helped thousands of our patients to heal properly. Mistake #6: Not Knowing That Auto Insurance Usually Pays For Treatment Without Up-front Fees. Our office will work with your attorney, insurance adjuster, or private insurance company, to avoid payment of services from coming out of your pocket. Mistake #7: Confusing What’s Most Urgent With What’s Most Important. So many people focus their entire lives on what’s urgent at the moment, instead of focusing on what’s most important. Make sure scheduling a consultation at our office carries the utmost importance. Why procrastinate if you are in pain? Call our office TODAY! A consultation with the doctor is always at no charge, and we can better assess your needs after speaking with you.